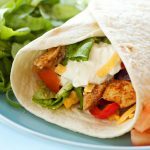 These Easy Oven Baked Chicken Fajitas are the perfect healthy meal for busy days! On the table in 30 minutes! Preheat your oven to 375 degrees Fahrenheit and add the olive oil to a large rectangular baking dish. Add the chicken breast strips, the sliced onions and peppers, and the fajita seasoning to the baking dish and toss everything together well. Bake at 375 degrees Fahrenheit for 22-25 minutes or until the chicken is fully cooked. Serve in warm tortillas with fresh tomatoes, lettuce, sour cream, shredded cheese, green onions, salsa, or whatever else your heart desires!